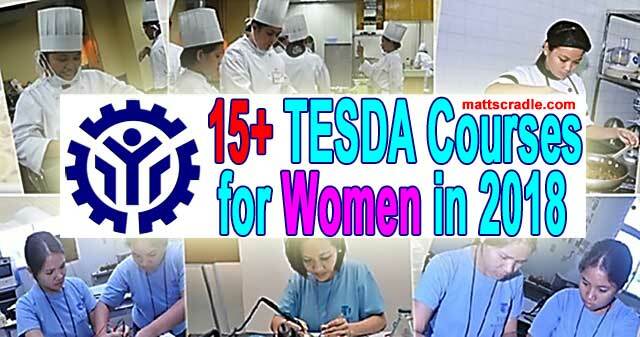 TESDA has several available courses / programs for women. You can find in this post the complete list of tesda womens courses with duration, enrollment details, email address, and hotline numbers in case you want to know more about their current programs. TESDA has helped thousands of Filipinos when comes to acquiring and enhancing their respective technical – vocational skills. The trainings they acquired became ladder for them to land a job in companies easily. According to their official website, 70 percent or 7 out 10 TESDA graduates gets a job. And 90 percent or 9 out of 10 employers are satisfied when comes to their work performance. For those who are not aware, aside from male trainees, TESDA is also accepting female trainees. In fact they have 17 courses specifically tailored for female students at their womens center in Taguig. Female trainees can choose courses like automotive servicing, cookery, consumer electronics, dressmaking, F and B, pharmacy services, and even plumbing, and metal acr welding. There are courses or programs that can be completed within 2 and half months, 3 and half months, and 4 months. The duration generally varies on the chosen course. Tesda has only 2 requirements to be accepted in the program. First, female applicants should be at least 15 years of age. Second, must have taken the National Career Assessment Examination (NCAE) or must undergo career profiling and trainability evaluation. Interested applicants can apply directly to Tesda Womens Center – Information and Referral Office (TWC – IRO) in Taguig. Their office is located at Gate 1 Tesda Complex, East Service Road in South Superhighway in Taguig City. They should bring ballpen (probably for filling up of forms) and two pieces (2pcs) 1 x 1 colored ID picture with white background. Their office accepts applicants on Monday to Thursday from 8:00am until 3:00pm. Interested parties can inquire directly to TESDA by calling these numbers: 887-77-77, 817 – 4076 to 82 local 278. They can also send email to tesdawomen(at)gmail.com. Replace the (at) with @ sign. Hi. Im actually interested to study in tesda women in your taguig site since im from taguig and wanted to know if cookery of hotel and management are still available and when can i soonly start. hello tesda,more power to tesda, may i know if you have giving free scholarship and training for slaughtering training or course? if you have, where can i take that training? thank you very much and more power to you? i understand that famale applicants must be at least 15 yrs old, up to what age do you consider? Hi available po ba hotel management? Good day I just wanna ask if there is a free scholarship and training in housekeeping located in Tesda Tayuman ? Thank you I’ll wait for your response. Hi, just want to ask if highschool undergrad are also welcome to apply for TESDA? Hoping for your feedback. Thank you! I also understand that your requirements for enrolling tesda is 15 years of age but until what age do you consider because I am interesting to enroll tesda the course I wanted to..but I am now 40 years old, is still I can enroll? I want to enroll at tesda but they need high school graduate i am undergraduate..so they want me to undergo ALS..is it possible to enroll in tesda even im under graduate in high school? Hi, may available slots for Japanese tutorial? I want to ask if you offer a course of Hair Laser Technician and how many months and is there’s a tuition fee for this? Because I have an experience in kuwait but i want to study to get a certificate.